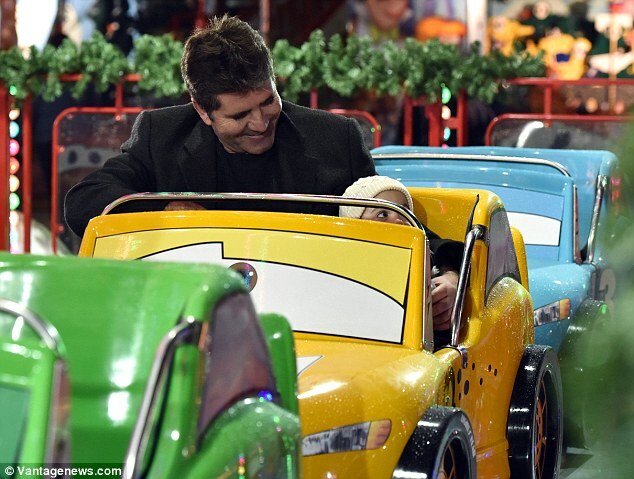 Simon Cowell showed his much softer side when he took his girlfriend Lauren Silverman and son Eric to Winter Wonderland in London‘s Hyde Park on Monday evening. The 56-year-old television mogul was pictured cuddling up to his stunning partner, 38, while eating a bag of chips and had a big smile on his face as he took his 21-month-old son on the rides. While Simon was wearing his trademark black suit trousers and Cuban heels, Lauren still managed to look glamorous in her winter warmers. She teamed jeans with low-heeled brown suede thigh boots, topping off her perfectly curled hair with a grey bobble hat. The couple took their delighted son, who was wrapped up in a cute hat and gloves on a car ride, reassuring him as he got used to sitting in it. Clearly onto a good thing, Simon took his little boy on another car ride, where he was able to sit beside him, before Lauren sat with him on the carousel. Following the X Factor on Sunday, Simon tweeted a picture of his beloved son sitting in his judge’s chair ahead of filming. This weekend, 4th Impact became the latest act to be elimination from the competition ahead of the semi-finals.